On May 26, 2011, Stafford Palmieri, who was then serving as the Education and Workforce Policy Advisor to Governor Bobby Jindal, testified in front of the Louisiana House Committee on Education in opposition to the repeal of the Louisiana Science Education Act (the LSEA). Ms. Palmieri, a 2008 graduate of Yale University, offered a notably convoluted and torturous defense of the LSEA, a law that allows public school science teachers the ability to bypass the teaching of science and supplement their curricula with their own non-scientific and religiously-based beliefs. “This bill is seeking to remove protections for teachers that give them the ability to teach the full breadth of scientific teaching,” Ms. Palmieri said. This is simply not true, however, as the LSEA has nothing to do with “scientific teaching” and everything to do with equivocating religious beliefs with science. Indeed, the LSEA does not “protect teachers” with “the ability to teach the full breadth of scientific teaching;” if anything, it harms our students by undermining the value and the integrity of science education. More than likely, the LSEA is also unconstitutional; it not only violates the precedent established by the Supreme Court case Edwards v. Aguillard, it also raises serious questions about our fundamental protection under the First Amendment against the state establishment of religion. No matter how hard some on the religious right may try, creationism and intelligent design are not scientific theories; they are both articles of religious faith. And as earnest as some may be in promoting such beliefs, when we conflate them with science, we are doing a disservice to both religion and science. A few months ago, Ms. Palmieri was promoted to Policy Director for Governor Bobby Jindal, a commendable accomplishment for a young woman who is still in her mid-twenties. But there’s an interesting footnote here, and it needs to be pointed out. 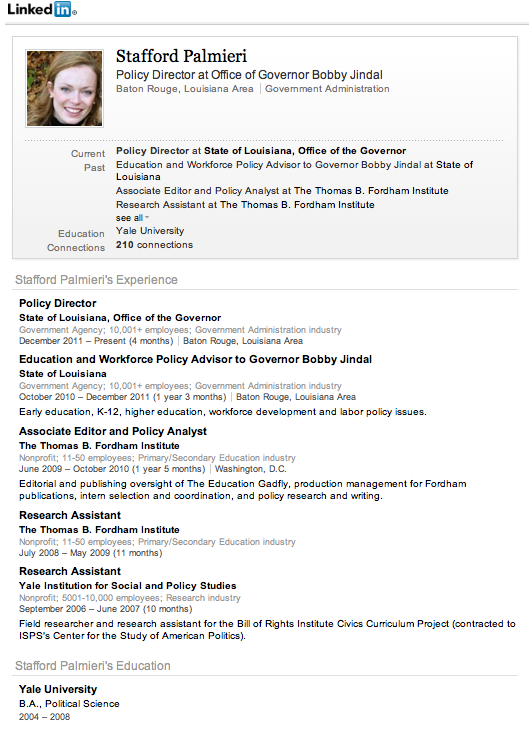 Ms. Palmieri, prior to joining the Jindal administration, worked for the Thomas B. Fordham Institute, where she oversaw the publication of its newsletter on education issues. The Louisiana science standards are reasonably challenging and comprehensive, but they suffer from a devastating flaw: Thanks to the state’s 2008 Science Education Act, which promotes creationism instead of science, the standards (especially for biology and life science) are haunted by anti-science influences that threaten biology education in the state. “A devastating flaw,” “haunted by anti-science influences that threaten biology education in the state.” This is not analysis by a partisan enemy of Governor Jindal; this is the opinion of the former employer of Governor Jindal’s Policy Director, a conservative think-tank. I don’t know Ms. Palmieri, but I’m certain of a few things: Her testimony to the Committee on Education was riddled with misrepresentations. It is exceptional and noteworthy that the former employer of Governor Jindal’s Policy Director would publicly criticize her policy statements on education, the very issue she worked on when she was under their employ. And considering this, along with Ms. Palmieri’s exceptional resume, I can only conclude that she is merely doing the bidding of Governor Jindal, even if it means turning against her own true beliefs and the outspoken, public statements of her former colleagues. This issue will not go away. I, for one, will not back down, and during the next few weeks, I’ll continue to call attention to this critical issue. Last year, 43 Nobel laureates supported a repeal of the Louisiana Science Education Act. And thanks to the continued efforts of my friend Zack Kopplin, there are now 75 Nobel laureates on board; it’s astonishing. The separation of church and state was not implemented to protect religion from overweening government, but to,protect free government from grasping religion.